Just two cats in the cat-room this week, so we were able to give nice long walks to both. Tiffany had both cats out and in a mellow mood when I arrived, each relaxed and sleeping curled up on or by the bench not far from each other in the outer room. We walked Avry first. And, as usual, at first she just kept making bee-lines from wherever I set her down back to the cat-room door. While good exercise, this didn’t seem the best use of her out-of-the-room time. So we carried her over to the far side of the store, setting her down in the training room. After exploring for a bit she did her usual little flirting game, rubbing up against things and weaving in and out among the stools and getting her leash tangled up. After a while we opened the door and she walked around that side of the store for a while. She was out for about forty minutes, maybe a bit more. Then it was Tris’s turn. As usual she greatly enjoyed just being out of the room, rolling belly-up on the tiles. Then she had a good time walking around the near half of the store. She was very sociable, going up and rubbing up against people to get their attention. Be warned, however, that when she’s belly-up she may look like she’s asking for a belly rub, but she’s not. She was also out for a good long spell, about forty minutes or so. One thing I noticed: either TIffany is a really good cat-walker, or the cats really like having two walkers to one cat, or both. Both cats were much less hesitant to venture into a new aisle or go into a new area than tends to be the case when I walk them one-on-one. Health concern: Tris has a lot of little scabs, especially around her neck. Got a few loose ones off; the rest shd come in time. Think she also has a little cat-acne on her chin, but she wasn’t at all interested in my doing anything about it. Her ears seem okay, at least on a quick check. Cleaned up her bottom some with a wet cloth, which was about her least favorite thing in the world. Also used another wet cloth to remove some loose fur along her back — she wasn’t sure whether she liked that or not. Avry seems to be doing well. She definitely likes having the big cage all to herself, especially having the high ground so nobody can sneak up on her. So, I've been on the record since about the time the HOBBIT films wound down, saying that the next Tolkien film we'd be seeing would not be anything from THE SILMARILLION (to which the studios don't own the rights) or one of Tolkien's minor works (much as I'd enjoy seeing a film of FARMER GILES OF HAM or THE FATHER CHRISTMAS LETTERS), but a film about Tolkien himself. There have been rumors and announcements over the past few years about this person or that person's plan to make such a film, all of which have, so far as I cd tell, evaporated without leaving any trace behind. The synopsis here reads: "J.R.R. Tolkien, a love lorn soldier, draws from an epic life on his return from the Great War to create one of the greatest works of literature in "The Lord of the Rings"." -- which makes it sound as if somebody owes Humphrey Carpenter and John Garth a credit. The imdb page also gives the film an alternate title: A LIGHT IN THE DARKNESS. "explores the formative years of the orphaned author as he finds friendship, love and artistic inspiration among a fellow group of outcasts at school. This takes him into the outbreak of World War I, which threatens to tear the “fellowship” apart. All of these experiences would inspire Tolkien to write his famous Middle-Earth novels." One description thus focuses on the love story and the other on the TCBS. Perhaps one thing which makes this iteration seem more real than those preceding it is that this one has an actor attached to it to play the lead part: Nicholas Hoult. Best known for playing the lovestruck zombie in WARM BODIES, Hoult seems to be making a specialty lately of playing historic figures in a series of recent films: Nikola Tesla, J. D. Salinger, and now Tolkien. More promising, he's also the voice of Fiver in a new adaptation of WATERSHIP DOWN. So at least they got a pair of English actors to play the leads, rather than Americanizing the project. There are a million things that cd go wrong this this project, assuming it ever gets from "pre-production" (= nobody's filmed anything yet) into actually getting filmed, and even released. But already this is the farthest anyone's gotten on an idea that's been kicking around Hollywood's collective mind ever since the last of Peter Jackson's billion dollar babies left the theatres. Whether it'll actually be any good is of course impossible to tell at this early stage. The thing Tolkienists will have to keep reminding ourselves of is that the words "based on a true story" = "this is a work of fiction". I expect 'creative embellishments' in a Tolkien biopic to be much harder to take, personally, than any adaptation of his work cd be (esp. since Tolkien himself sold the rights for LotR and H to be made into film, yet eschewed biographical inquiry with some insistence). In short, we know Tolkien himself wd have hated the v. idea. But it looks like it's coming, if not now and with this team then down the road with another. Those of us who cd look on with equanimity at the outrage of C. S. Lewis fans at Anthony Hopkins portrayal of CSL in SHADOWLANDS** are about to find it's our turn now. *note that only Gleeson appears on the imdb page; can't say whether this is for reasons of space Beresford's leaving the project. Time perhaps will tell. So, thanks to Janice S. and Janice K. for the following link to a piece in THE ATLANTIC marking the 80th anniversary of the release of THE HOBBIT last week. It's nice to see a good example of the mainstreaming of Tolkien's work: I was particularly struck by the use (here and elsewhere, in the pieces on Walter Judd's book) of the word legendarium to describe his imaginary world. The ATLANTIC writer, Vann R. Newkirk II, early on makes clear that he's an admirer of the book, calling it "the best that literature has to offer". He's not being condescending by describing Tolkien's book as "quaint, virtuous, and tidy" but wants to emphasize how much such hobbitlike virtues stand out in contrast with R. R. Martin's work. It's also good to see Newkirk acknowledge how deeply Tolkien's work permeates the fantasy genre, establishing the conventions against which later-day writers react. I do think he overstates his case for Martin as the quintessential modern fantasy writer, failing to take into account, say, J. K. Rowling and Harry Potter, or Sir Terry Pratchett, or Phillip Pullman, or Neil Gaiman, et al. To his credit, he gets the importance of the languages, and on one point he certainly gets credit for originality: I don't think anyone has ever compared Bilbo with Mohammed Ali before. Newkirk does ding the book for "paternalism, imperialism, and racial essentialism" but these do not detract for him from its celebration what he calls "quaint values": "the dignity of humanity, the virtue of generosity, a respect for life, a duty to do good, and the ways in which brotherhood can be used to move men toward those ideals". I wish the average piece on Tolkien that comes out in mass market magazines was half as good as Newkirk's piece. So, thanks to friend Stephen and to Janice K. for the links to two online pieces, one by ENTERTAINMENT WEEKLY and the other on NPR, on the recently released FLORA OF MIDDLE-EARTH: PLANTS OF J. R. R. TOLKIEN'S LEGENDARIUM by Walter & Graham Judd. (Oxford Univ. Press). At first glance this sounds much like Dinah Hazell's book from about ten years ago (THE PLANTS OF MIDDLE-EARTH: BOTANY AND SUB-CREATION,) which was well-received but seemed on the slight side to me: I'd been hoping for something more along the lines of PHARAOH'S FLOWERS: THE BOTANICAL TREASURES OF TUTANKHAMUN by F. Nigel Hepper, which goes through every piece of plant matter (flowers, woods, seeds) found in Tut's tomb and extrapolated upon what that tells us (e.g. local vs. imported exotic). So, during those final days of editing and fine tuning and formatting on A WILDERNESS OF DRAGONS, I needed something completely different to read just to give my mind a rest (otherwise I proofread in my sleep, hour and hour, all night long). And I picked Fritz Leiber, author of the best sword and sorcery fiction ever, and read several books of his that've been on my shelves without getting read till now (as well as rereading a few to reconsider my original responses to them). I find I much prefer him as an author of fantasy than horror or science fiction, and accordingly got rid of some in the end while restoring the rest to a place of pride. more trenchant pen,** were temporarily exhausted. "For all do fear the one known as the Gray Mouser . . .
the moment of victory in no common fashion, was begun. of these got actually completed and found their way into print . . .
the City of the Forbidden Gods still seem far away." So, for one thing I failed to note the interesting detail about Lankhmar being a city of the Tuatha de Danaan --whose legends do indeed mention four exotic cities that had been the Tuatha de's homes before they came to Ireland (albeit that 'Lankhmar' is not given as the name of one). It might be worthwhile to see if this is just a casual association or if the old Irish myths have other deeper connections with Leiber's cycle. For another I missed the fascinating fact that the first mention of the two heroes is in a story intended to end with their deaths. In short, a story very like several of Dunsany's thieves' tales or, more specifically, Clark Ashton Smith's THE TALE OF SATAMPRA ZEIROS. And yet so far as I can tell Leiber never returned to or finished that first story, which was to have begun and ended the whole sequence. So, I see the news today that the latest in the Stieg Larsson Lizbeth Salander series, better known as THE GIRL WHO books, is just out. Of course it's not written by Larsson, who died more than a decade ago, but instead by a noted biographer named David Lagercranz. Nor does it follow any plot left behind by Larsson; it's wholly new material written to continue the series beyond the point where the author stopped. As someone who was an early adaptor and longtime fan of Pratchett's work,* I'm sorry that there won't be any more of it, but at the same time there are plenty of genuine Pratchett books to read and re-read. And a few, even, that I haven't gotten to yet (having found I didn't care for his later books as much). So, hard to believe it's been twenty years ago as of the start of September that I moved from Wisconsin to the Seattle area to start my new job at Wizards of the Coast. I'd been hired on to edit the new DOMINARIA roleplaying game, the D&D campaign setting for the world of MAGIC: THE GATHERING, becoming part of a team that consisted of Lisa Stevens, later co-founder of Paizo; Jonathan Tweet, who went on to gain fame as the chief architect of Third Edition; Jesper Myrfors, the original art designer of MAGIC THE GATHERING; and later Chris Pramas, brought in as a second writer, who eventually left WotC to found Green Ronin. All water under the bridge (and living in Renton and Kent teaches you a lot about water and bridges). But what stays in my mind, after all these year, is just how much talent was in the room. That, and how it was great fun to be the keeper of the Dominaria globe for a few months. I wonder who has it now. *a similar silent veto applied to our doing any kind of Tolkien game. So, thanks to Andrew F. for the link to this radio drama based on young Ronald Tolkien's courtship of Edith Bratt. Have to confess I haven't made it all the way through it myself; it's well-done but for some reason off-putting. Apparently it'll still be available on the radio BBC's site to listen to for about another week. So, the night before last I was quite startled when I went to check on the moon (which I do most nights, when I can manage it) and saw that it was an orangey-red in color, more the tone you get with a partial lunar eclipse than the rising of a harvest moon. 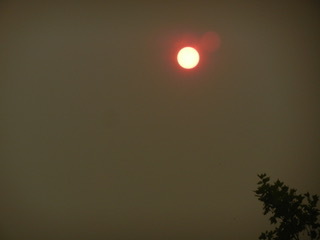 Then yesterday morning the sun was odd too: distinctly red, and casting red sunbeams early in the day. By mid-morning we were getting yellow sunbeams out of a white sky. Over in Des Moines (the Seattle suburb, not the city in Iow a) the sun looked more like the design on the New Mexico flag, except a-symetrical. 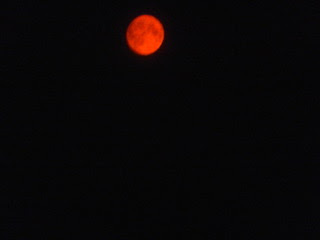 Last night came a dim red moon, not visible at all early in the evening, but I think even redder in color. All this is side-effect of the out-of-control wildfires burning elsewhere in the state, one of which actually jumped the Columbia River Gorge (quite a feat in itself). Every level surface has tiny flakes of ash scattered here and there; the amount of smoke particles in the air was enough to cool down the temperature a little yesterday, which was supposed to have hit the record for hottest day of the year, had the smoke in the air not mitigated it. Reminded me of the definite temperature drop at the time of the eclipse two weeks ago. It's at times like this that I really begin to understand how the major meteor strike that set off the dinosaur extinction or the effects of a really major Krakatoa-level volcano eruption can produce effects so far away from the actual site of the event. Here are two pictures, curtesy of Janice: first Monday night's moon and then Tuesday's sun. So, all the files for A WILDERNESS OF DRAGONS are now in the publisher's hands. Between now and the book's release date I'll make posts here from time to time to keep folks updated on how things are going. Meanwhile, here's a slightly earlier version of the Table of Contents, from the flyer distributed at Kalamazoo and Mythcon this summer: all the contents are the same as the final one that'll be appearing in the book but their ordering has been slightly rearranged and some of the essay titles have altered slightly. So, today I made my first turnover on A WILDERNESS OF DRAGONS. The first quarter of the book is now in the publisher's hands. Further developments to be posted as they occur. --not yet doing The Dance of Doneness but starting to warm up. current reading: THE FIRST EMPEROR (coffeetable-size catalogue from the exhibition of Terracotta Warriors I saw in the British Museum in 2007 and then again here at the Seattle Center two weeks ago tomorrow. Interesting but unwieldy.